Fancy a few hours in the trees doing a high ropes challenges? The ropes courses involves plenty of fun and adventure and is the perfect way to get outdoors and try something that is guaranteed to have stunning views. Fancy doing an adventurous and fun activity? then a few hours in the trees doing a high ropes challenge is the perfect activity for that unique experience and the ultimate in adrenalin fun. No matter what the occasion, Stag/Hen party, family day out or a birthday, or wanting to conquer a fear of heights a high ropes course has something for everyone. The ropes course involves plenty of fun and adventure. It is the perfect way to get outdoors and try something adventurous that is guaranteed to have stunning views no matter the location. 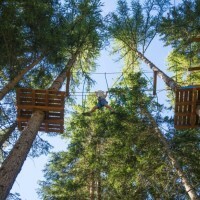 The activity involves tree top high ropes, wires, bridges, tunnels, tricky crossings and walkways. A great team building activity or individually challenging. The high ropes set up varies dependant on location so please just ask one of our friendly staff who will be willing to help!